Two out of 12,000 EnergyFlux external batteries-and-hand-warmers caught fire, so all (with that particular battery) were recalled. They sent us special lithium battery envelopes. Here's the label if you want one for your box. UN 3481 is an electronic device with "batteries included," either packed with the device or built into it. 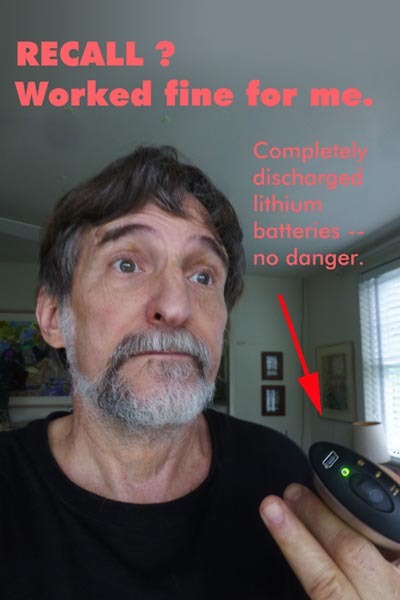 UN 3491: ditto, but lithium metal batteries, not lithium ion (aka lithium polymer) batteries. Lithium metal means cylindrical cells or button cells. UN 3480/3490: A battery-only shipment, either lithium ion (-80) or metal (-90). If you mix the two kinds, you can put both UN numbers on the label. "UN" is "United Nations" -- for global regulations, who you gonna call? The phone number is yours -- "a person knowledgeable about the shipment," not a first-responder, not someone able to answer for more than the usual business hours. 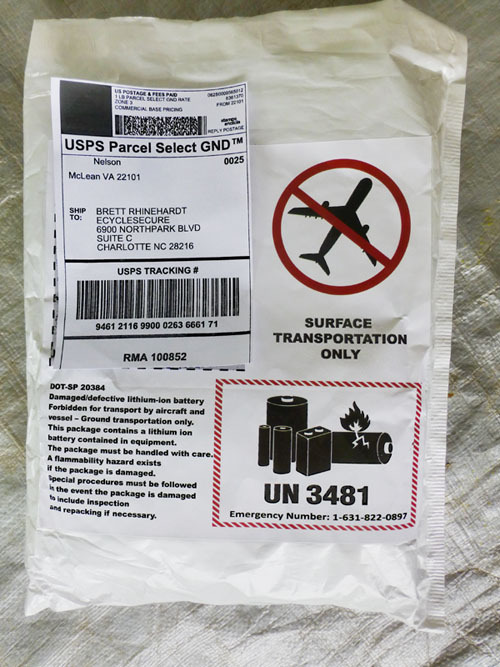 Fewer than 4 rechargeable lithium-ion cells or only one lithium-ion battery in a shipment does not require this label. I got this label only once when I bought three lithium cellphone replacement batteries at once. Airplanes are another story: no loose, spare lithium batteries in checked baggage, period -- have pity on the airlines, fires are awful for them, and, down in the cargo hold, no one will notice in time. Your in-cabin devices can have 100Wh of lithium-ion batteries installed, and 20Wh of "metal" cylindrical cells. Notebook/tablet/smartphones are all under the 100 Watt-hour (W-h) limit, although Apple wishes they could build a MacBook Pro with more battery power than that. My old (2008) MacBook Pro is 12.75oz = 362gm for 50Watt-hours. Turning from "lithium-ion" batteries to "metal" cylindrical cells, the limit of 20 W-h is approximately one large "C" cell. For less powerful NiMH chemistry, 20 Wh would get you an even larger D-cell at 2.5V x 8000mAh. New NiMH D's are rated 10,000mAh, you get 9,000 for a while and then they are 8000 for years. 20Wh also gets you four NiMH AA cells at 2000mAh. Watts are amps times volts, so 2,000 mill-amp hours (or 2 amp-hours) x 2.5V is 5 Watt-hours, and it takes four of them to reach 20. The regulations for non-rechargeable lithium cells/batteries are written in terms of grams of metallic Lithium per cell . . . as if battery technology never changed, as if no battery manufacturer ever heard of nanotechnology. What about spares for in-cabin, accompanied baggage? If each Li-ion (aka Lithium polymer) battery is under 100Wh, you can take an unlimited number of spares because anyone could smother a little fire in a little battery. For the 100 - 160Why "extended life" battery packs sold for notebooks and used in pro audio-visual equipment, two spares are allowed. Airlines get confused, and limit all external Li-ion battery packs to two spares per customer carry-on. No, rechargeable lithium batteries are always shipped charged. Nobody dead-shorts a lithium battery with a piece of wire, and all electronic devices don't take batteries down to dead-flat either. Devices turn off before their batteries lose voltage completely, otherwise the plates (electrodes, anode/cathode) get damaged and life is shortened. But we were told to discharge our defective EnergyFlux battery before mailing in the recall, since they were going to be thrown out anyway. So all of these labels are a waste of time, not counting the Idiot Factor . . . (someone who mails but did not discharge first). VOLKSWAGEN'S NIGHTMARE: Truth in Lending Clause: there is one computer-controlled electronic device which runs the battery down to dead flat if you leave it turned on: our new (2017 ) VW Golf Alltrack. Some programmer forgot to add the shut-off at 10-point-something volts to the firmware. We never wanted to trade in our old VW, but it had firmware that was just a little too perfect. The firmware detected whether the car was going through vehicle emissions tests (and always passed) or whether you were on the open road (when it jazzed the engine for maximum performance at maximum pollution generation). What a car! We passed every test, and got 50 mpg highway. VW has paid $14.7 billion to replace all the cars like ours, $30 billion overall. Guess VW missed the detail about never completely discharging a rechargeable battery. It's hard to worry about destroying your customer's car battery when you are so busy destroying your own company. home for this website, such as it is.